One of the best things about the US Open is court-hopping. Today there were sixteen courts with matches being played at the tournament, from the awe-inspiring "big house," star-studded Arthur Ashe Stadium to the field courts where you can feel as if you're watching the best public park match in the history of the game, the US Open is a veritable smorgasboard of choice...and we like to gorge. When you're on site, you're not beholden to who a broadcast network thinks you'll want to see, or the TV courts streaming matches, you get to see as much or as little of the event as you want in as leisurely or manic a fashion as you want. It's truly a "choose-your-own-adventure" event. In case you can't make it out to Flushing Meadows, here's our take on some late afternoon court-hopping. Louis Armstrong Stadium - Louis Armstrong Stadium gets no love. The very top players rarely find themselves on Armstrong, the way they do on Wimbledon's Court 1. We'd posit that Roger Federer's never even heard of the place. Baseline and courtside seats are sold, making Armstrong the only court other than Ashe to have some reserved seating and frankly, the space just doesn't have the intimacy or electric atmosphere of its neighbor and our unabashed favorite, the Grandstand. Still Armstrong is a show court that sees its fair share of electric matches every US Open. We're big fans of climbing the back stairs and emerging at the top of the sawed-off stadium (capacity was reduced when Ashe was opened) and bypassing the (too) long lines to get into the court and the gawkers at the top of the stairs who slow entry to a crawl at all of the primary entrances. Today we found ourselves in Armstrong for the final few games of Sloane Stephens' 6-3, 6-4 win over 22nd seed Francesca Schiavone. Thanks to Twitter, we knew that Schiavone was in an ornery mood before we made it out to the USTABJKNTC giving the chair ump the business in no uncertain terms and that Stephens had taken advantage early. Twitter also reminded us that Stephens isn't exactly imbued with the killer instinct. More than once the young American has been on the verge of big wins before nerves and shanks disabled her. There would be no such wobble today. In those last couple of games, Schiavone smacked the ball with purpose uncorking her big one-hander crosscourt and down-the line, creating compelling, crafty rallies with the 19-year old American. Unlike the Italian, Stephens stayed calm, yet aggressive as the pressure mounted at the end of the match. 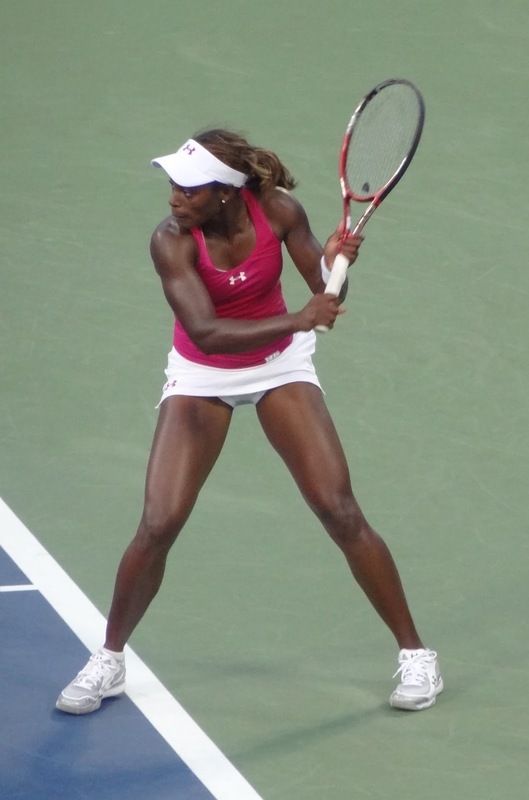 As she said jokingly in press about the American Express campaign featuring Stephens all around the tournament grounds, "I love seeing myself and other people love seeing me too, so it all works out." On court today, it did all work out. We'll be seeing more of Stephens later in the tournament, hopefully those future encounters will be as positive as this one. Stephens moved on to the next one, no fuss, no muss, as did we. Grandstand - It's all but impossible for us to ignore the siren's call of repeated cheers as we're on the grounds, so as soon as Stephens wrapped in Armstrong, we made a beeline for the buzzing Grandstand court. Darting past indecisive (and probably lost) packs of tourists, chatty teens and the freebie folk angling for a shot to catch one of the freshly autographed tennis balls Stephens launched into the crowd after her win, we made it to the conclusion of the tilt between 10th seeded Argentine Juan Monaco and Spain's Guillermo Garcia-Lopez. When we arrived the Argentine fans were buoyant. Decked out in soccer jerseys, chanting for their man "Ole, ole, ole, Pico, Pico," but there was plenty reason to worry. Unlike in soccer, there's no clock to run out. Monaco had won the first two sets in fairly routine fashion, but that's not enough. The digital match length clock was malfunctioning, but I could see that the players had been on court for at least four hours. No matter, Pico Monaco would need to win a third set. By the time we arrived Garcia-Lopez had negated the Argentine's scoreboard advantage, pulling even forcing extra time. A sudden death fifth set, that Monaco had to feel like he didn't belong in and Garcia-Lopez had to feel in some respects that he didn't deserve to be in. Garcia-Lopez hadn't just lost the first two sets, he was being routined, 6-3, 6-1, not to mention, he racked up 30 errors, winning a set requires just 24 points. If this were say, Cincinnati, or any other non-major, Garcia-Lopez would be on a plane back to Spain; but it was here, the US Open; and it would be Monaco, not he, who would be on a plane home. Garcia-Lopez survived the ultimate pressure cooker, breaking to win the 3rd set 6-4, then a 4th set breaker 8-6 before being pushed to yet another breaker in the fifth. Monaco was in sight of the finish line for literally hours, but he was stuck, mired in the muck. Despite being a top 10 seed at the Open for the very first time, Monaco continued his disappointing run atop the Queens swampland on which the Tennis Center was built. This was the 28 year old Tandil native's ninth US Open and his seventh first round exit. Court 13 - Rather than head for the exits as the night session crowds begin to filter onto the grounds, many savvy day pass holders maximize the value of their tickets by checking out the field courts after the day session is done on Arthur Ashe Stadium; especially when those matches are headlined by name players. He may not be a household name in this country by any means, but 21 year old Bernard Tomic is a well-known entity among the tennis twitterati meaning his match on Court 13 was by no means a sedate field court affair. Grown-ups scampered up bleachers; while young kids found their way on top of shoulders to check out the Aussie sensation's opener vs. Argentina's Carlos Berlocq. Berlocq, a 29-year old enjoying a late career surge, is just a few spots off his career high, ranked 44th in the world. Tomic, ranking dented by an early Wimbledon loss is ranked just one slot higher. Berlocq won the first set 6-4, but slowly the Aussie began imposing himself, claiming the next three in short order, setting up a meeting with 20th seeded American Andy Roddick in the second round. Andy Roddick is no stranger to Court 13, having cajoled the umpire into moving his match with David Ferrer there a year ago after the court surface bubbled up, but we would venture to guess that Tomic and Roddick won't be coming back to Court 13 for their next match. Court 17 - Quickly climbing the ranks of our favorite courts is the Tennis Center's newest showcourt, 17. Opened a year ago with temporary bleachers, this sunken bullring of a court behind the foodcourt functions as the fourth showcourt and often plays home to compelling matchups featuring seeded players and/or Americans. 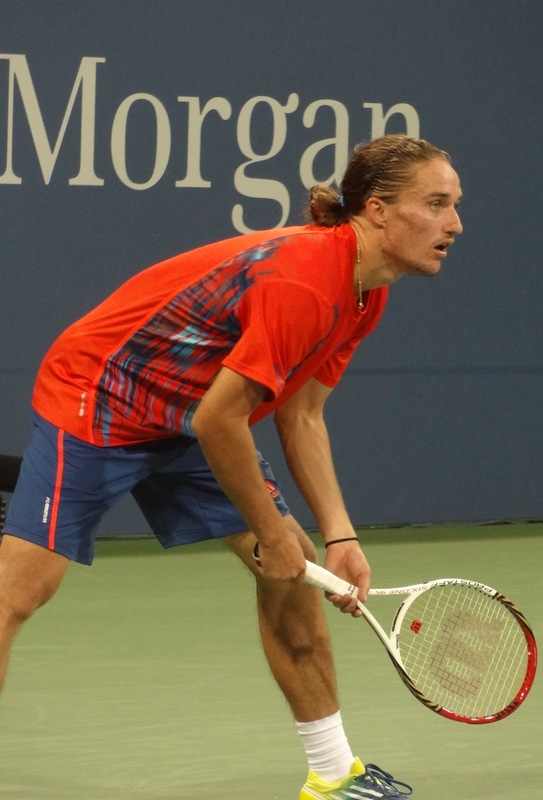 Today, the court saw all the makings of a massive upset, on one side of the net, 14th seeded Alexandr Dolgopolov. The ponytailed Ukrainian with the funky junkballer's game drew 24 year old American lefty Jesse Levine, best known for practicing with Roger Federer. To understand the difference between their levels, Dolgopolov has only made $15,000 less than 2012 than Levine has made on court during his entire playing career. Yet, the American had reason to believe, plenty of it, in the form of two sets won with relative ease, 6-3, 6-4. We followed the score on the US Open and when it looked like Levine was about to score the upset, we made our move. Arriving in the vicinity of the court at 4-all, we thought we'd get in during the changeover; we mistimed our approach and realized we missed the set, never mind though, from there Levine's game began to desert him. All of the strong work he'd put in was being washed away like wave wet sand. Levine went down any early break and we saw two things. One, the writing on the wall and two, the fact that Serena Williams was rolling through her match at breakneck speed. We took our leave of 17 and made our way for Ashe. We could always come back, we said. There was no need, we missed nothing but Levine's wilting at the hands of his more experienced opponent. 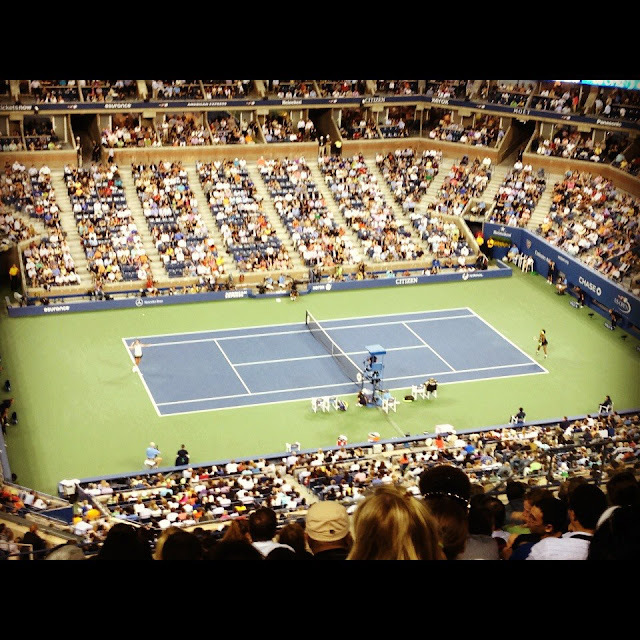 Arthur Ashe Stadium - We made our way up, up, up the stairs to our perch near the end of the alphabet of rows of seats. Pretzel braid in one hand, drink in the other; prepared to watch Serena and Coco Vandeweghe. Blinked. Missed it. The 55 minute 6-1, 6-1 match had all the drama of a Toy Hunter marathon. None. It was over before it started, those matches often are. No worries, I still got plenty of value for my Arthur Ashe night session ticket...even if I spent all of fifteen minutes on the stadium court. thus, care for the Artist Chanel Purses and handbags oh, fake cartier don't allow the above folks notice the key. there are numerous sort of folks we could notice the girl persona coming from the girl handbag. Blended and also disorderly sort: chanel replica online When the lady desire to locate one thing from your carrier she will get all the stuff in whose sale benefits, fake hublot This lady has the particular feature regarding females: passion, excellent connection, large. At times take action unforeseen. chanel replica Clean sort: The lady set every one of the thing in the particular handbag inside apple-pie buy. This type of females hold the persona regarding authority, yet the lady has to be not enough creativeness. Mindful sort: this type of females regarded all the questions connected. fake prada sale Inside their purses and handbags you will find regular sewing products, any plaster, multi-function cutting knife. They are going to appease folks, self-confidence and also beneficial. Modern day sort: set makeup products inside their any Chanel Purses and handbags Knockoffs. US Open is basically known as the biggest tennis tournament, so the excitement and entertainment are quite high. This tournament is basically playing in different courts as according to this article and we definitely get an excitement series in different courts with different professional players.